R. Bouwmeester & Associates, a civil engineering firm, provides specialized sun and shadow position modeling services related to collision and crime scene reconstruction, forensic photo/video analysis, and urban development, site planning and building design projects. Initial consultations are free of charge. Contact us. The firm provides opinion letters, technical analyses and reports, and CAD drawings. For examples of our shadow studies and solar access studies, and 3D driver's eye perspectives in the case of crash investigations, please visit our page Modeling Applications. Ralph Bouwmeester has provided expert witness testimony in the field of sun position modeling. He has appeared as an expert witness before criminal and civil courts in traffic collision cases and criminal investigations in both Canada and the US, and before the Local Planning Appeal Tribumal (LPAT) (formerly Ontario Municipal Board (OMB)) in land development application hearings. The modeling is carried out through the use of a computer model developed by Ralph in the early 1980's which simulates the daily "motion" of the sun and calculates its position in the sky relative to any location on earth at any time - past, present or future. For an overview of this site's contents, or for help finding what you need, please click the Site Map link. You may also search using the Search this Site link. In the collision and crime scene reconstruction fields we are called upon to confirm historical sunrise and sunset times, to determine the sun's position relative to the field of view of a driver (or pedestrian), to determine the limits of shaded vs. sunlit areas, and to provide general input related to glare, blinding, contrast, shadowing, visibility, ambient lighting, etc. We also provide investigators with alternate dates and times at which a scene can be visited and photographed under similar lighting conditions (e.g. including daylight, dawn and dusk). In addition, we conduct forensic shadow analyses of photos and videos to determine (or confirm) the date and time they were taken. Alternatively, if the date and time are known, we can narrow down the location where the photo or video may have been taken. In the fields of urban development, site planning and architecture we are called upon to prepare shadow impact studies, solar access studies and daylighting analyses. Shadow impact studies include technical reports and drawings showing the predicted shadow patterns of proposed building projects. From these we determine how much sunlight will be lost in specific locations as a result of the building project. Solar access and daylighting studies allow architects and planners to maximize exposure to sunlight in specific areas within a building (e.g. sunroom, living room, etc.) or on a site (e.g. pool, patio, etc.). Enquiries are always welcome, and our Clients throughout the world appreciate our prompt and personal responses. Contact Info or Direct E-mail. Do you need to know a historical sunset time for a collision investigation, or a future sunset time for an outdoor wedding? We would be happy to provide the answers...free. ...what was the direction of the sun at sunrise(set)? ...what was the position of the sun relative to the field of view of the driver? ...could the sun have impaired the driver's vision? ...was the pedestrian stepping out of shade? ...what time will the sun rise(set)? ...what will be the direction of the sun at sunrise(set)? ...how many hours of daylight will there be? ...where will shadows from the proposed building fall? ...how will my property be affected by shadowing from the proposed building? ...how can I modify my building design to minimize shadowing next door? ...where is the sunniest location for my pool or patio? Mr. Bouwmeester is available to address seminars and conferences on this topic. (April 8, 2019) March 2019 interview with Debbie Lazaga on Milwaukee's WTMJ Radio about the challenge that sun glare poses to drivers. (April 4, 2019) Sample sunrise/sunset tables for April 2019 have been posted. The tables include the times of rise and set as well as the time of solar noon and the total number of daylight hours for each day of the month. Note: All times are given in Standard Time; adjust for Daylight Saving (Summer) Time if in effect. Click here to view or print the samples or to order a free table for your location. (January 7, 2019) May 2018 TV interview with CityNews Toronto in connection with the City of Toronto's new Downtown Plan that aims to preserve sunlight on downtown parks. (January 7, 2019) April 2018 TV interview with GlobalTV News in connection with the Humboldt Broncos bus crash. (December 27, 2018) November 2018 radio interview with Kelly Cutrara on AM640. 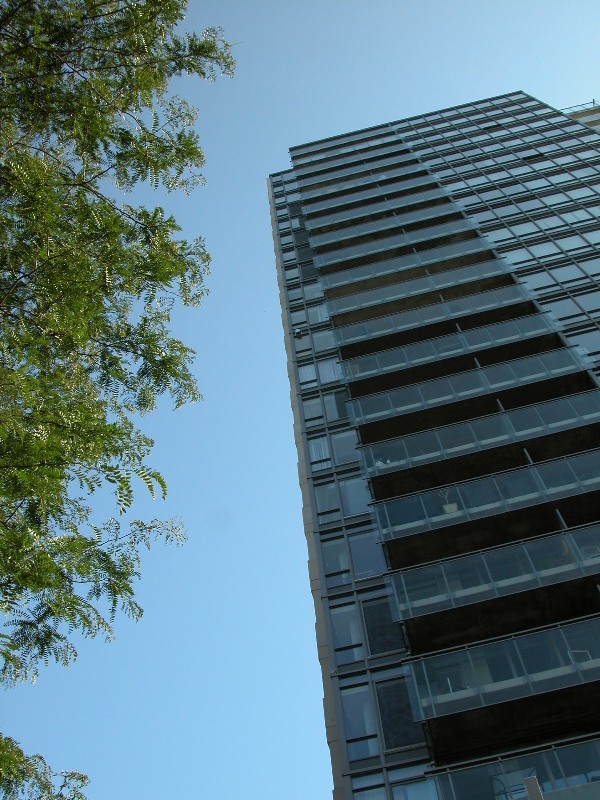 Talking shadows from high-rise condos in Toronto and what the City does/can do to minimize them. (December 27, 2018) November 2018 interview with Donovan Vincent of the Toronto Star for his piece about the citywide housing shortage in Toronto which has led to calls for more density and the inevitable increase in shadowing. (December 27, 2018) May 2018 interview with Lauren Pelley of the CBC for her piece about Toronto's new downtown plan that aims to create 'livable' communities by preventing high-rise shadows on parks. (October 23, 2018) 2018 Halloween sunset times added for select Canadian and US cities. (February 2, 2018) Sunrise/sunset tables for the PyeongChang Olympics and Paralympics. (October 21, 2017) Info re: the last Torontohenge of 2017. (October 21, 2017) 2017 Halloween sunset times added for select Canadian and US cities. (September 1, 2017) Our monthly tables include Houston. Thoughts and prayers to all. (June 27,2017) Canada 150 Solar Event - visible across Canada on July 1st, 2017. (October 25, 2016) 2016 Halloween sunset times added for select Canadian and US cities. (August 24, 2016) August and September 2016 sunrise/sunset tables for Amatrice, Italy were added showing rise/set times and number of available daylight hours. (May 9, 2016) We added sunrise/sunset tables for the Rio 2016 Olympics and Paralympics. (May 6, 2016) May 2016 sunrise/sunset table for Fort McMurray AB was added showing rise/set times and number of available daylight hours. (October 8, 2015) 2015 Halloween sunset times added for select Canadian and US cities. (September 30, 2015) Take our survey: How Important To You Is Sunshine? How much sunshine, when and where? (May 12, 2015) Kathmandu, Nepal sunrise/sunset table was posted to assist earthquake victims and rescuers. (May 11, 2015) We added a sunrise/sunset table for the Toronto2015 Pan Am and Parapan Am Games to be held in July and August 2015. (November 6, 2014) NASCAR Sprint Cup driver and six-time champion, Jimmie Johnson, told me via Twitter on October 25, 2014, that "The late stages at PIR are tough with the sun in your eyes." In response, I prepared a sun angle diagram for the next Sprint Cup race at Phoenix International Raceway (PIR) scheduled for Sunday, November 9, 2014. (October 10, 2014) Torontohenge is coming up on October 25th when the sun sets in line with major east-west streets in Toronto. 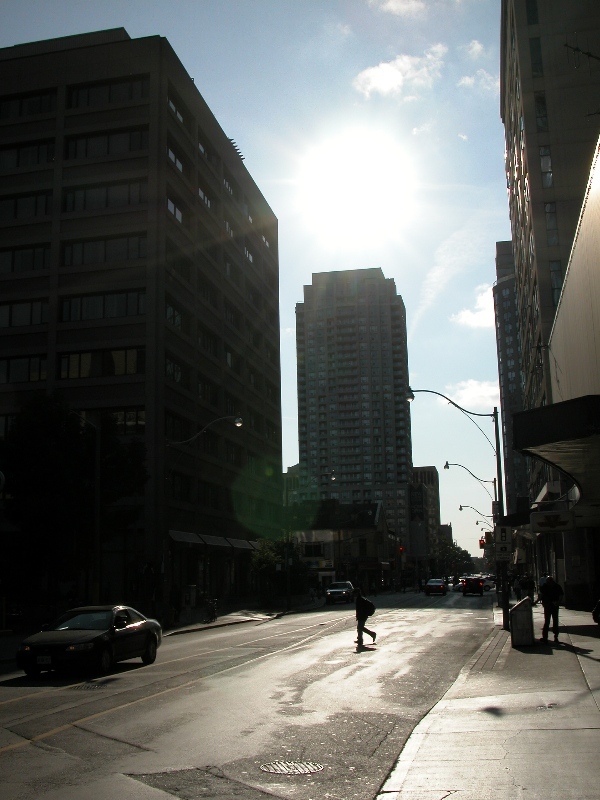 For viewing times see our Torontohenge page. (October 10, 2014) 2014 Halloween sunset times added for select Canadian and US cities. (March 24, 2014) A sample list of our Clients has been added. (January 3, 2014) We added sunrise/sunset tables for the Sochi 2014 Olympics and Paralympics. (October 21, 2013) 2013 Halloween sunset times added for select Canadian and US cities. (September 7, 2013) Fryscrapers - We added a page describing some of the more famous cases of tall buildings frying their surroundings. For example, the current media hoopla about the Walkie Talkie tower in London, England, recent stories about the Museum Tower in Dallas, and articles about the Vdara Hotel in Las Vegas and the Frank Gehry-designed Walt Disney Concert Hall in Los Angeles. (August 27, 2013) We are now on Facebook. Follow and Like us. (October 10, 2012) 2012 Halloween sunset times added for select Canadian and US cities. (August 1, 2012) Reminder: Sunrise/sunset tables for the London 2012 Olympics. (August 1, 2012) Sunrise/sunset tables for Calgary AB have been added. (February 13, 2012) We were interviewed for this story about a crossing guard hit by a car in Cresskill NJ on Feb 10/12 where police suspect sun glare was a possible factor. (February 3, 2012) We added sunrise/sunset tables for the London 2012 Olympics. (October 19, 2011) 2011 Halloween sunset times added for select Canadian and US cities. (October 11, 2011) Our interview with the Times Herald-Record of Middletown NY. "Judy Rife: A sure sign of autumn: sun glare when driving." (May 17, 2011) This month's sunrise/sunset table for Slave Lake, Alberta was posted to assist those involved with the wild fires. (March 11, 2011) To provide rescue workers with daylight availability data for Japan after today's earthquake and tsunami, we added this month's sunrise/sunset table for Sendai. (March 1, 2011) Ottawa has been added to our list of sunrise/sunset tables. (November 16, 2010) We welcome you to follow us on Twitter at @SunPosition. (October 20, 2010) 2010 Halloween sunset times added for select Canadian and US cities. (July 12, 2010) An article has been added regarding ceremonies held in June 2010 at the Air India Memorial in Toronto. The ceremonies marked the 25th anniversary of the bombing of Air India Flight 182 and were highlighted by an address by Canadian Prime Minister Stephen Harper on the June 23 anniversary date, and a private ceremony on June 28 attended by Indian Prime Minister Manmohan Singh. Repairs to the sundial (which had been vandalized - see May 19 entry below) were completed just in time for the two ceremonies. Click here for story. (May 19, 2010) Two media articles have been added describing the recent vandalism to the Air India Memorial Sundial in Toronto. The story of our design and the unveiling in 2007 can be found here, while the media articles about the vandalism can be viewed here - Global TV, Toronto Sun. 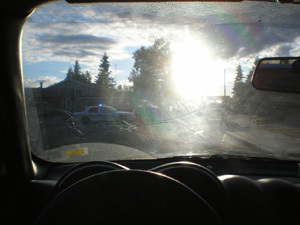 (April 12, 2010) We added an article about the dangers of sun glare while driving during the spring and fall. The article includes a link to a story and interview with us as published in the Omaha World-Herald on April 1, 2010. (February 4, 2010) In early 2008 we were retained by BBDO (Toronto) to design a solar-powered billboard (actually a shadow-animated billboard) for a Frito-Lay SunChips ad campaign by Juniper Park of Toronto. The billboard was installed in Oakland CA on Earth Day 2008 to mark the opening of the solar-powered SunChips plant in nearby Modesto. A time-lapse video of the Sunchips Solar Billboard can be seen here. Congratulations to Juniper Park, who on January 28, 2010, took home the 2009 Cassies Grand Prix for the SunChips ad campaign. (January 14, 2010) A sunrise/sunset table was added for Port-au-Prince, Haiti, in support of those involved in rescue and relief work. The free table provides rise and set times and the total number of hours of available sunlight for each day of this month. (January 6, 2010) Free sunrise/sunset tables have been added for those of you visiting Vancouver or Whistler BC during the Olympics and Paralympics in February and March. (October 30, 2009) Halloween sunset times added for select Canadian and US cities. (October 1, 2009) Sample photos of the effects of sun glare while driving. (September 30, 2009) In response to numerous enquiries, we have prepared a graphic showing the duration of sun exposure on the various faces of a building. Our sample applies to Toronto ON and is based on the orientation of Toronto's street grid. (July 27, 2009) We added a Blog which has been set up as a discussion board where you can post stories or ask questions. (January 5, 2009) Sample sunrise/sunset tables have been added for Chicago, Denver, Halifax, Houston, Miami, New York City, San Francisco and Winnipeg. (December 15, 2008) The story of our design of the Air India Memorial Sundial unveiled in Toronto, Ontario, by Prime Minister Stephen Harper on June 23, 2007. (October 14, 2008) See this YouTube page for a time-lapse video of the SunChips solar billboard in Modesto California as designed by R. Bouwmeester & Associates. (October 1, 2008) Commuters' sun glare graphic as published in the Des Moines Register on September 16, 2008. 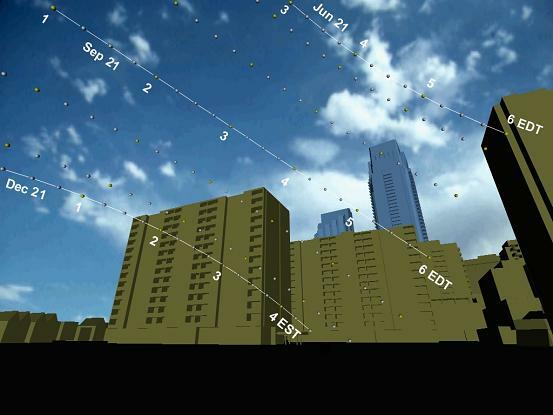 (December 28, 2007) Virtual Modeling of Tall Buildings - Sun & Shadows - presentation made on October 19, 2006, at the Higher Learning Symposium, Toronto, Ontario. The event was co-sponsored by the City of Toronto, the Canadian Urban Institute and the Toronto Society of Architects. (June 1, 2005) Commuters' sun glare graphic re-printed from the Des Moines Register (March 21, 2005 edition). (March 24, 2005) "Search this Site" link added to Home Page. Sept 18/04 - mentioning our firm in an article regarding 1 fatality and 2 collisions blamed on sun glare. 3. Rise/Set Times in Monthly Calendar Format. See samples of each by clicking on the links above. (January 2, 2004) Our list of Representative Projects has been updated and reorganized. · a sample 3D house model showing the shadow impact of a proposed second storey addition. (March 1, 2003) The time format (hh:mm:ss) has been revised to make the times easier to read. (February 11, 2003) For those of you interested in this month's sunrise/sunset data for the Middle East, we have added tables for Baghdad, Kabul and Kuwait City. (January 1, 2002) We added a Site Map which will help you quickly find what you need. Our most popular pages are still accessible from the menu to the left. We have also updated our "project samples" pages with better graphics and more detailed explanatory notes. Have a look if you haven't visited in a while. Follow the links on our Modeling Applications page. Click here for a sampling of our Clients. Our data (much of it free) and modeling services have been used by professionals, organizations and individuals around the world. We would be pleased to provide you with the data you need, or to simply answer your questions in a personal and timely manner. · collision reconstructionists, lawyers, and police officers looking for historical sunrise or sunset times, or sun position data related to a collision or crime scene. Contact us for free data. See Modeling Applications for more details. · criminal lawyers seeking input regarding time of day, visibility, lighting or identification issues. In addition, we provide forensic analyses of photos and videos to determine and/or confirm the date and time they were taken. R. Bouwmeester & Associates welcomes and encourages applications from people with disabilities. Copyright © 1997 - 2019, R. Bouwmeester & Associates. All Rights Reserved.